The gentle slips and slides of one month into another are often punctuated with some of the most unexpected and breathtaking displays of seasonal shift. Curtains drawn back on an early morning can reveal a stage filled to flowing with a swirling murk, sifting the day’s first rays that eventually manage to push through to backlight dew laden, Summer-weary growth, rendering everything it touches gilded and vivacious once more. Indeed, some of these performances deserve a standing ovation. Autumn has focussed her gaze on the sun’s shifting arc and now with an easy and remembered rhythm, is steadily making her way towards Winter with all the confidence of a pro. And yet there’s still a warmth in the air. 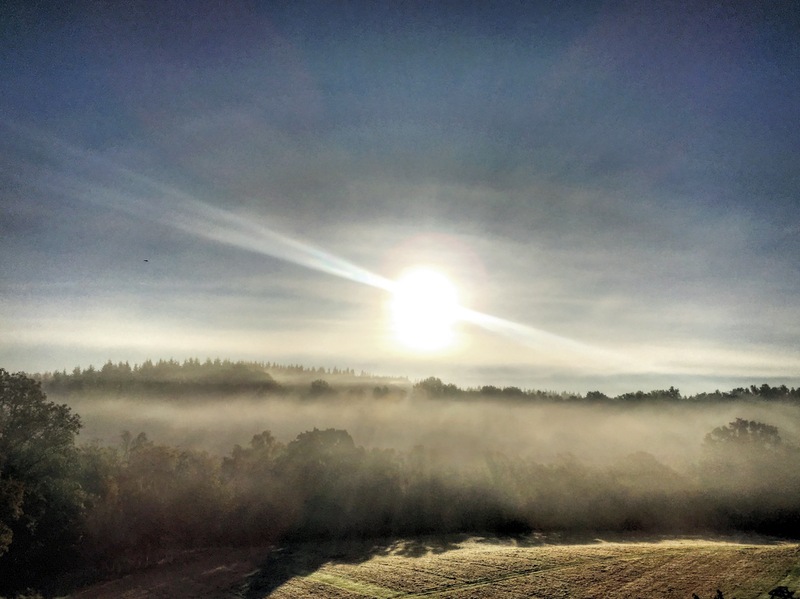 When the sun’s light reaches these low slung mists, they puff into embryonic plumes that become liberated and lifted to surf among the silent gathering of fledgling thermals. Days that begin this way are destined to be labelled as halcyon, bucolic. Less Turner, more Titian. I try hard to commit them to memory, but always with the hope that it won’t be needed as there’ll be a repeat performance showing soon! As ever, most of these early mornings are spent jamming bare feet into wellies and retying my dressing gown to head out and into the field for a walk, look and listen. More often that not I return with a wet hem and an armful of something that makes me happy. With the kindest of Septembers, cheerful dahlias, tomatoes and figs have featured frequently in these last few weeks. But there’s nothing quite like seeing a morning through someone else’s eyes. 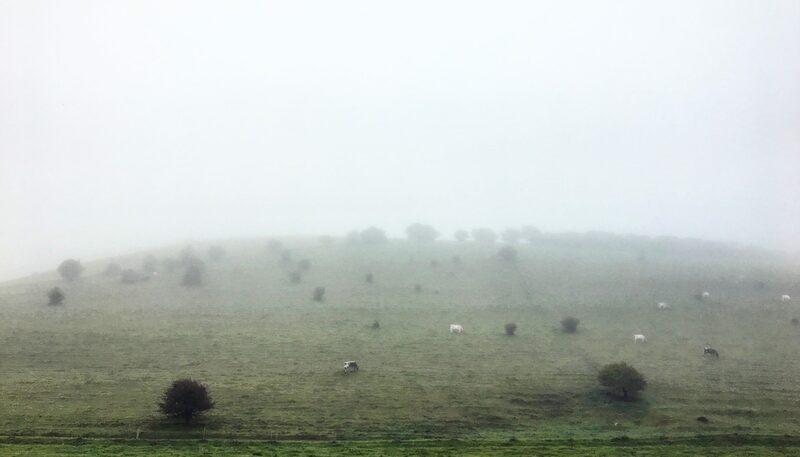 And so a few days ago I set my alarm to an ungodly hour that no bird would consider sensible, and drove through these mists to meet a good friend on the edge of a little village that sits within one of the many dips of the South Downs. With hushed words ( I’m never quite sure why we do this, but we do, don’t we… as if we might wake up the birds, the earth even) we made our way through the meanders and forks of the rutted tracks that flow through these well-trod ways. These paths were banked by crowds of rusted, long limbed wild carrot, empty baskets held high to roll with the moving mist like a sepia sea in constant flux. Among their feet grew a smattering of field scabious, small daubs of mauve to brighten this desolate view. We kept walking, talking, pausing to look beyond the fog, and eventually climbed up onto a shoulder of this rolling body of land. As we stood just above the quilt of fog, my mouth became a silent ‘O’. So many skylarks! No longer the joyful ascension to babble and bubble unseen, but now in plain sight. Their song, delightfully conversational as ever, had taken on an air of busy urgency as they jousted and swerved, engrossed in the game of territorial rights. Having heard but never seen a skylark before, it seemed that we were now the invisible ones. I stood so close as they rode the sky. I whooped and wowed as they scored and sliced through the fog-heavy air, courageous riders of some indiscernible rollercoaster. To look at, with an objective eye you would see that there’s nothing particular impactful in their attire. Skylarks are of medium height, with a medium length of wing span. Their markings, being muted flecks and bars of buff, biscuit and cream are designed for camourflage among the cropping fields in summer and beyond. The most distinguishing feature might be considered its quirky brown-streaked crest that can look fairly punkish when raised. But to put it bluntly, they’re not exactly catwalk material in the bird world. Yet to actually see them at all felt wholly miraculous. And so of course to me, they were all the more beguiling for their unassuming choice of plumage. My breath was taken, and replaced with a smile as wide as our view. 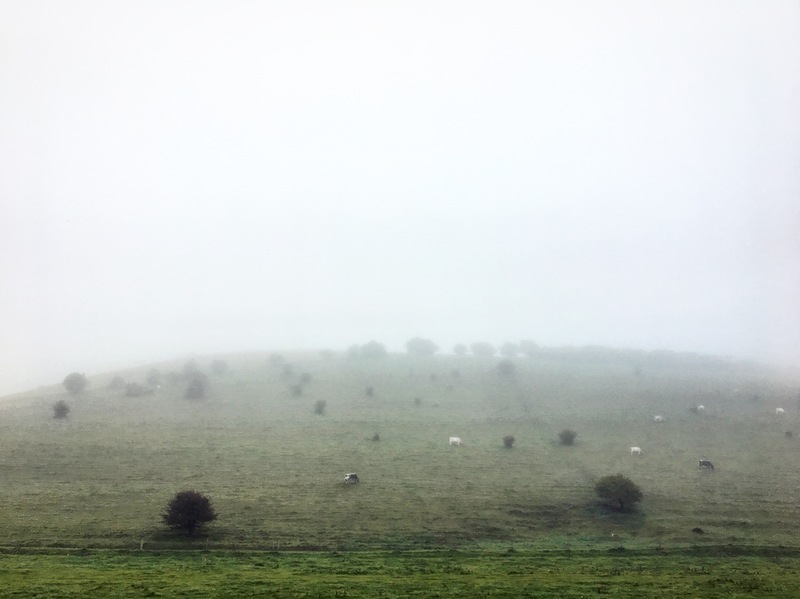 As I gathered myself together, filing away this extraordinary memory under ‘unlikely to see again’, we made our way back down through the cool pockets of lingering mist and into the nearby town of Lewes. While my friend headed on foot to his office, I caught a train back to the little village where I’d left my car. Times like this can impact one’s life in a wholly unexpected way. I’m sitting here, typing about this moment and yet I have visuals of other moments throughout my childhood, with my father and his birds. And I’m almost flooded to overflowing with the technicolour, surround-sound joy of them all as they flicker past like a zoetrope on full tilt. I’ve written before about Dad, and perhaps I’ll write more in due course, but for now, if you’d like a read, click here. It’s time to stop now, make more tea, and head up to the studio. There’s a huge squid on a canvas up there, and it can’t paint itself!